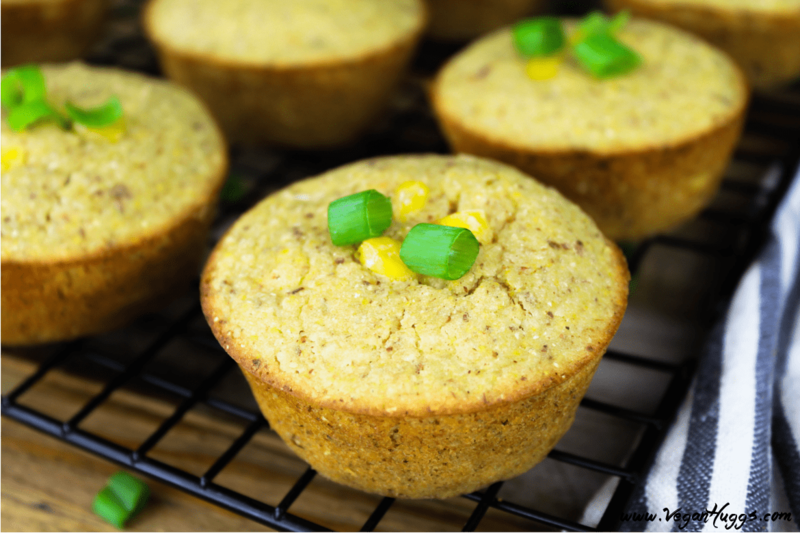 These Gluten Free Vegan Cornbread Muffins are subtly sweet, moist and crumbly. They are made with pure & simple ingredients that you probably have in your pantry now. I’ve always been a big fan of cornbread. Hasn’t everyone? I was especially crazy for it when I was a kid. It was the only time it was acceptable to have yummy cake with dinner (anything sweet & spongy was cake to me). My mom would whip out the Jiffy box and I would smile from ear-to-ear. Do you guys remember Jiffy? Gosh, I couldn’t imagine what’s in that list of ingredients now. Well, I’ve left all that bad stuff behind, but kept the yummy part. These Gluten Free Vegan Cornbread Muffins are easy to make, just as delicious and worlds healthier. Sounds like a good exchange, right? I’m not gluten intolerant, but I do feel more bloated when I consume too much, so I try to limit it when possible. 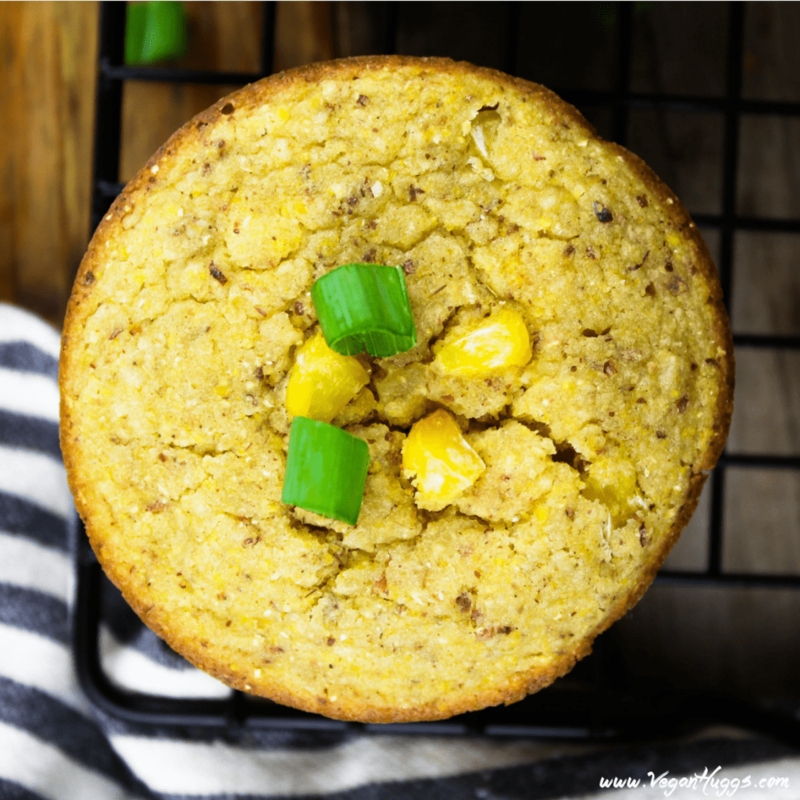 These Gluten Free Vegan Cornbread Muffins make a wonderful replacement to traditional cornbread recipes. I made them using oat flour, corn meal, almond meal, ground flax, almond milk, virgin coconut oil, pure maple syrup, apple sauce and corn kernels. No funny stuff in these golden muffins, so you can feel good about feeding your family “cake” for dinner. 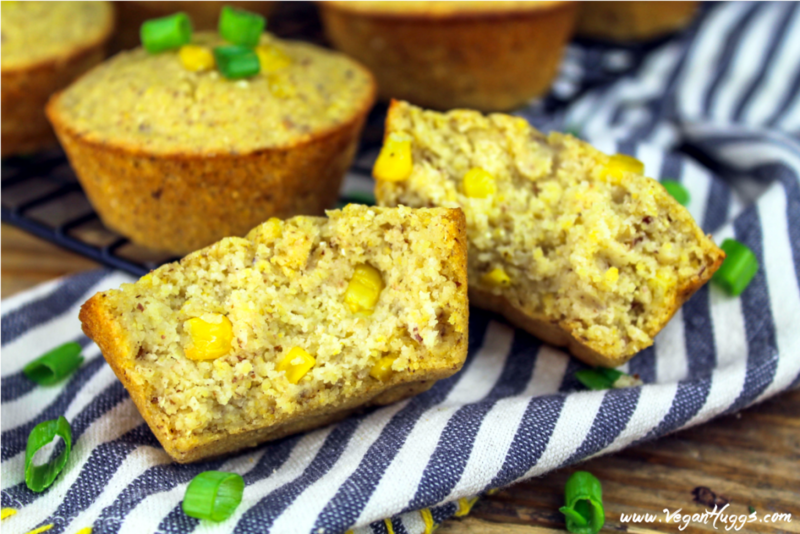 In my opinion, cornbread goes with just about anything…hell, I’ve even enjoyed them for breakfast with maple syrup drizzled on top. However, they really pair perfectly with a warm bowl of chili, soup or stew. Getting hungry yet? These muffins are moist, fluffy, crumbly and sweet with slightly crispy edges. 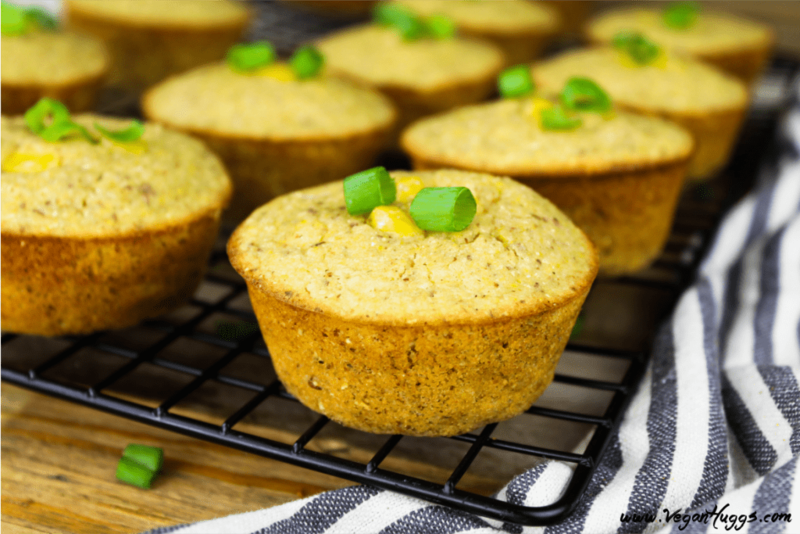 This combination is bound to bring some smiles to your table and you can smile too, knowing that they’re a healthier alternative to most cornbread muffins out there. If you’d like to see some more muffin recipes, check out these Strawberry & Banana Breakfast Muffins. They are a heathy on-the-go treat. Or, if you would like to see more recipes using corn, check out my Vegan Potato, Leek & Corn Chowder. It’s hearty and nutritious! If you’ve made one of my creations, I’d love to hear from you. Leave a comment below and let me know what you think. 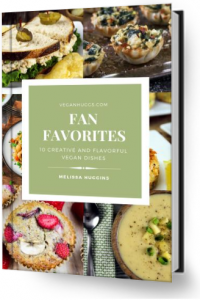 You can also follow me on Instagram and share your creation with me, Just tag me @veganhuggs and hashtag #veganhuggs. Ok, are we ready to make these little pieces or heaven? Let’s do this…. Place 10 muffin liners in a standard muffin pan. Or, you can lightly grease each slot. Prepare flax eggs in a small bowl and set aside, about 10 minutes. In a separate small bowl, add the almond milk and lemon juice (or vinegar). Set aside about 10 minutes. This creates a vegan buttermilk. If using rolled oats, make oat flour by placing 3/4 cup oats in a blender. Blend until finely ground. In a large bowl, add oat flour, almond meal, corn meal, baking powder, baking soda & sea salt (All dry ingredients). Combine well. In a medium bowl, combine flax eggs, buttermilk, applesauce, melted coconut oil & maple syrup. Whisk to combine well. Now add the wet ingredients into the large bowl of dry ingredients. Fold batter gently until combined, but don't overwork the batter. Gently fold in corn. Fill each muffin liner (or greased slot) about 3/4 full. 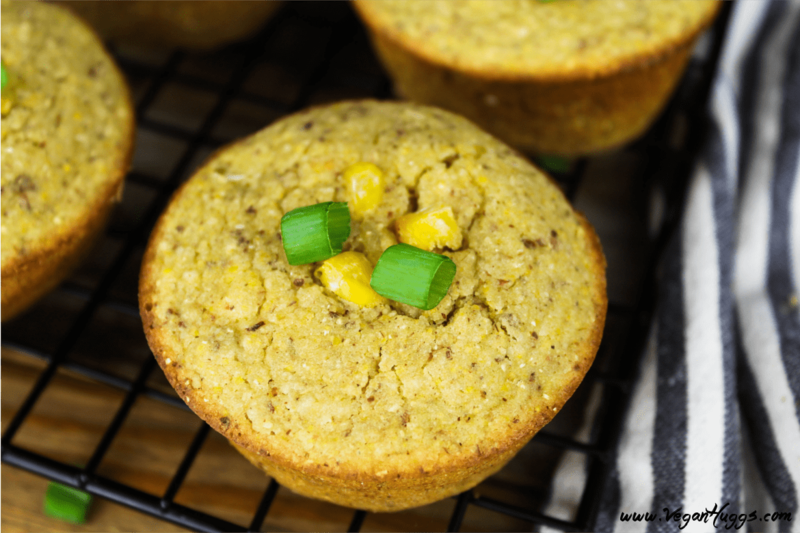 Top each muffin with a few corn kernels. Place in oven & bake the muffins until they are slightly golden on top, about 20-25 minutes. Insert toothpick into middle of muffin, if it’s mostly clean, then they're ready. Let cool for 10 minutes in the pan before transferring them to a cooling rack for another 10-15 minutes. To avoid the liner sticking to the muffin, let them completely cool before enjoying. *Flax Egg Alternative: 1- If you don't have flax seeds, you can use chia seeds instead. The measurements and method are the same as the chia, but you'll keep the chia seeds whole. 2- Another alternative to the flax eggs, is the liquid from a garbanzo bean can/pack. You will need 5 tablespoons of liquid to replace the flax egg. Just whisk well into the wet ingredients. * If you only have whole flax, you can grind the flax seed in a coffee grinder. *Oat Flour: This can easily be made with rolled oats (not instant), by placing 3/4 cup oats in a blender. Blend until finely ground. I made these today but had to make a couple of changes due to lack of ingredients. I didn’t have applesauce and used apple butter instead. And I didn’t have any corn. They are so delicious that I can’t seem to stop eating them. Thank you for the recipe and I will buy the proper ingredients for the next time I make these. There will definitely be a next time. Trying this today. Looks outstanding. Just a brief note — the corn got left off the ingredients list.